The classical method originated in ancient Rome and Greece over 1,000 years ago and until recently was used throughout the Western world. Most of America’s founding fathers as well as the world’s philosophers, scientists, and leaders between the 10th and 19th centuries were educated this way. It has taken modern educators only 50 years to disassemble an educational system that took thousands of years to refine and establish. The classical method, or “trivium”, refers to the three stages of learning that coincide with a child’s natural development as he matures. These are the 1) grammar stage, 2) logic stage, and 3) rhetoric stage. Grammar StageChildren in Kindergarten through about 4th grade are in the grammar stage and have a natural ability to memorize tremendous amounts of information. 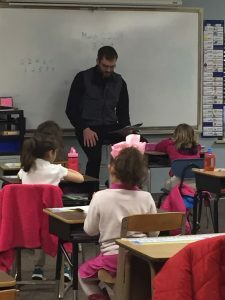 Classical education takes advantage of this ability by giving the students the factual foundations of each subject to memorize such as math facts, poems, hymns, Scripture, and phonics and grammar rules. Songs, chants and rhymes are used to help children enjoy the learning process. Logic StageThis stage includes students in about 5th through 8th grade. These students are beginning to think independently and are taught to order facts into organized statements and arguments. Rhetoric StageThis stage includes students in the 9th through 12th grade. Rhetoric is the art of communicating well. Once a student has learned the facts and can organize them, he must then be able to communicate the facts to others and form opinions based on the facts he has learned.